Ramp up excitement for your holiday soiree with the very red Rudolph party invitations. Rich red pearlescent cardstock - a luxurious and fine heavy Italian paper. Round corners lend modern sophistication. DIY imprintable, or we can print for you. Comes with a 4 inch bellyband made from handmade crinkly cotton rag paper embedded with real chips of festive shiny mica. Finished with one half inch double faced satin ribbon. Extremely easy to assemble and very adaptable for further customization. Add bits of last year's Holiday decorations as an embellishment, and you've made this spectacular invitation your own. Diecut Invitation card with rounded edges. Handmade paper bellyband, closes as back with a bit of gluestick (Included in kit.) Bright bits of shiny real mica lends a festive sparkle. Finish with doublefaced red satin ribbon. Modern, handsome, and classic. Fits perfectly in a standard #10 envelope. Our envelopes are made in a matching pearlescent 70 lb paper with a deep flap. On a super budget? Less expensive softwhite envelope is available. (CALL US: 888.349.4684 for specifics) This design is impressively polished AND very budget friendly. You can print laser or we can print for you! Click on Print Quote button for printing calculator. Colors: Red, softwhite and champagne. 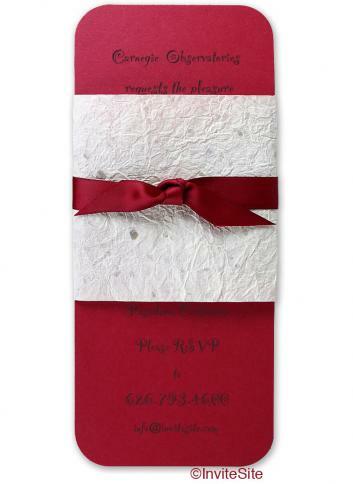 Invitation sheet:Holiday Red Italian cardstock 105 lb. Diecut rounded corners. Ribbon:One foot of red double face satin ribbon per invitation. Envelope:#10 size envelopes in pearlescent champagne Italian paper.